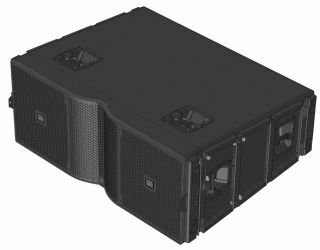 At Prolight & Sound 2012, HARMAN's JBL Professional is expanding its VTX Line Array Series with the addition of two subwoofer models, the VTX S28 and VTX G28. VTX S28The VTX S28 and G28 are dual 18-inch subwoofers, each employing two 2269H 18" transducers featuring Differential Drive® technology with two voice coils, two neodymium magnets and extremely high peak-to peak excursion capabilities to deliver extended low-frequency performance. Both models are reverse cardioid-arrayable. The VTX S28 can be suspended or ground-stacked and is cardioid-arrayable in either configuration for improved rear rejection. Compatible with VTX V25 suspension, the S28 can be suspended at the top of V25 arrays to extend the effective low-frequency line length, providing improved vertical pattern control combined with improved rear rejection when used in cardioid mode. Alternatively, S28 arrays (cardioid or front-firing) can be suspended beside or behind V25 arrays. For theatrical sound design, the S28 can be suspended in the middle of flown V25 arrays to facilitate balcony and floor coverage by allowing improved under-balcony penetration. Larger cardioid configurations are also effective where S28 is suspended or ground-stacked in multiple cardioid blocks, each block consisting of three enclosures. The VTX G28 is ground-stackable, but with a practical form factor for convenient stacking and additional enclosure volume, plus port tuning that delivers true sub performance down to 22 Hz @ -10 dB. The VTX subwoofers are comprehensively tested in JBL’s power testing facilities. During the design phase, JBL power testing submits each component and system to 100 hours of continuous, high level input. The S28 and G28 feature Crown Audio VRack DSP and amplification. VRack is a rugged touring rack fitted with three Crown I-Tech HD Series power amplifiers, power input panel, and custom-engineered input/output panels that is available in two configurations: VRack 12000 and VRack 4 x 3500 are equipped with three IT 12000HD and three IT 4 x 3500HD amplifiers, respectively. VRack ensures compatibility for cross rental between VTX Network Partners. Since VRack is supplied with all components installed and internally connected, there is also no need for laborious rack building; no chance that a component might be improperly connected; and a lower chance of connection failure. VTX’s patented S.A.F.E. suspension system is streamlined for speed and efficiency with improved hardware with fewer pinning operations and greater security. A custom-designed protective cover and dolly makes transport easy. Vertical Transporters will be available allowing for transport of four V25 enclosures or three S28 enclosures in either front-firing or cardioid mode.